Sold by Primegoods2 and Fulfilled by Amazon. Gift-wrap available. Amazon's Choice for "kong dog toys"
Sold by Primegoods2 and ships from Amazon Fulfillment. 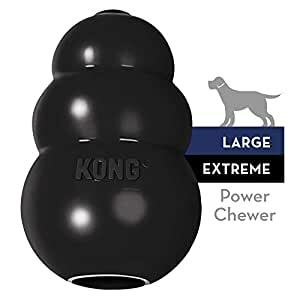 So far this is the best toy I have found, our dog goes through it in about a month, but any other toys he destroys in about 20 min, we have a 90lb American Staffordshire terrier and the size XL works best, the XXL didn't last as long because he can get his mouth inside it better to tear it apart. I had such high hopes for the Kong Extreme, but less than 35 minutes after stuffing two Kongs for two different dogs, both toys were emptied and destroyed. 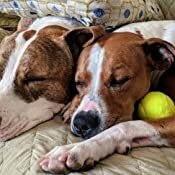 I have a 50-pound Boxer/Pit mix (Jasmine) and a 60-pound American Bulldog (Brody) mix. Brody gets credit for destroying most hard toys, while Jasmine takes credit for taking care of all soft toys. 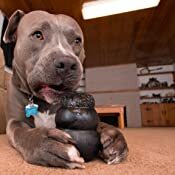 I've included a video of Brody quickly destroying the second Kong, hoping it might serve as a reference for others in terms of chewing persistence and strength. Once he figured out how easy it was to remove the top of the first Kong, he used the same strategy for the second and popped it off in less than 90 seconds. 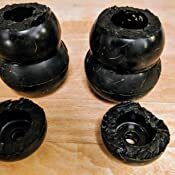 If anyone has other suggestions for durable, engaging toys that make smart dogs use his or her mind to solve problems (and be rewarded with treats), I would love to know. 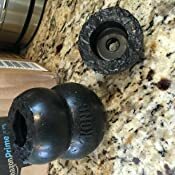 I have tried the Starmark toys (both the bob-a-lot and the cube), Busy Buddy Linkables, the Petsafe Buddy Squirrel, and some of the "board games". Because I work from home, I'm looking for something that will quietly preoccupy two high-energy dogs for at least as long as a 12" rawhide stick - 30-90 minutes. 1.0 out of 5 starsPossible Fake. Split in half after a couple uses. 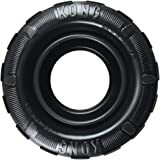 Along with the other 1-star reviewers, this KONG is garbage. 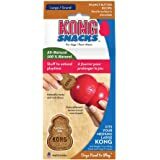 I bought a larger red Kong from a local store and lasts my "brass teeth" lab months. 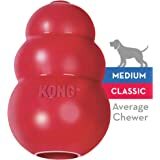 This Kong didn't even last 10 uses! 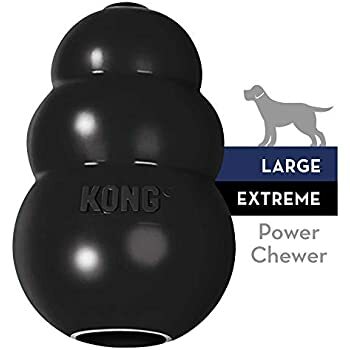 Either the "Extreme" Kongs are poor design OR these (like many other things on Amazon) are knockoffs that nobody caught yet. I'm tempted to buy this exact one on the local store to rule out fraudulent Amazon purchase. Amazon Customer Service, coming from someone that relies solely on you for many of my purchases, it is important to trust you. Please do an audit (not only the Kong) and get rid of the fakes! 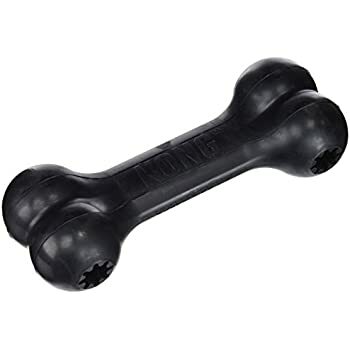 5.0 out of 5 starsIF YOU'RE TRYING TO KENNEL TRAIN, THIS IS A MUST-HAVE!!!!!! WONDERFUL! We watched a video last night on puppy training. Let me preface this by saying, we've had about 30 dogs & just as many cats our 35 years of marriage. However, at our age, we just can't stand watching our dogs pass away. We've always adopted older dogs to give them a good quality and love filled end of life, but the grief is just too difficult to handle anymore. So my husband said our last dog will be a puppy that we will have for many years. He comes home with a 45 pound 6 month old puppy! Now, he does all the walking and training and such. We watched a video that made the most sense out of all of them, found out he's rated in the high to 50 in the States, and decided to follow his advice. 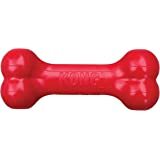 He said, to teach them to eat at a certain time, like when we eat, b/c we're kennel training, the best thing to do is moisten their dog food, when it's a mush, put it into this toy & freeze it. 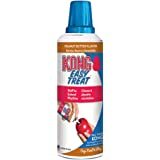 Then, when you're having your dinner or have to leave the house to work or whatever, take one put some peanut butter on the end, and put it in the kennel with them. 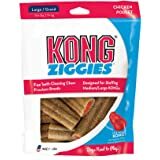 It meets their need to chew, they get feed their portion (you should divide how much they eat into 2,3, or 4 portions) and these with that mixture I mentioned earlier. They are content in their kennel, they love the chewing on them, but are slowly being feed their portion of dog food as an extra plus! We just started it and it worked beautifully. Bought 2 to begin with, and will be ordering 2 more. Always have at least 1 extra in the freezer in case company comes and you need to put them in their kennel for a bit. Excellent product. 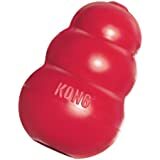 My son has had the same exact Kong for 4 years now, and he has a Golden Retriever! 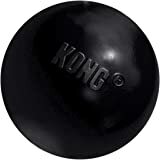 Kong's are a fantastic toy for MOST dogs but not ALL dogs. My dog has a very strong chew style. I don't leave her unattended with toys because she will tear them apart. 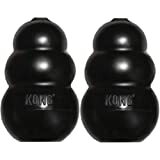 I decided to try the Kong as a way to extend dinner time; Fill it with kibble and put peanut butter on the bottom. She did great licking the peanut butter and getting the kibble. It took 20 minutes. After the food was gone, she gnawed at the top and ripped the toy open in 10 minutes. 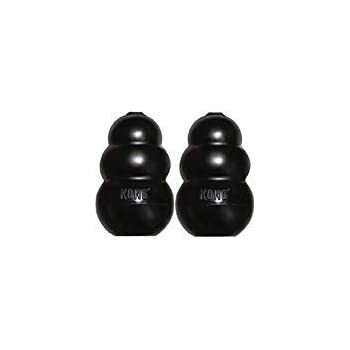 The reason for this review to remind everyone to monitor your dogs with toys. People use the Kong to help with separation anxiety and boredom. Before leaving your dog unattended with a toy, make sure that you know that the toy/dog combo is OK. 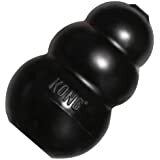 I'm giving the Kong 4 stars because I know it's a good product, but obviously didn't live up to my needs. In case anyone is wondering, the one toy that can withstand her chewing is the Goughnuts Maxx. The toys from Goughnuts are pricey, but have a 100% replacement policy. 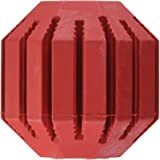 They are made with a inner safety indicator (red means stop) and different strengths of exterior material.